Namaste! Yoga has been steadily gaining popularity over the past several decades and now has over 36 million yoga practitioners in the U.S. alone, which is a startling 15 percent of the country’s adult population. It’s expected that the ancient art began in the fifth century, and in modern times, many associate the ancient art with physical fitness, but its true value lies in maintaining a health chakra as well as improving breathing and boosting the immune response. Yoga is easy to practice at home, but many people find that a dedicated yoga mat makes it harder for you to dangerously slip in slide around the room when you are practicing, so we created this guide in order to educate you about what makes a great yoga mat and what to look for when you are looking to purchase one. Our Gold Pick yoga mat, like all of the yoga mats in this guide, is an excellent product if you are planning to practice your yoga on a flat, carpetless floor. Carpet tends to combine with your padded mat to provide too much cushioning, resulting in reduced balance when you are doing one foot poses. BalanceFrom is a well known manufacturer of some great balance-based products, which are designed to help you get in shape; these include balance balls and yoga accessories like non slip socks. As a Gold Pick product, this yoga mat has a lot of positive reviews on both consumer and critical sites, so you know that it is of the finest quality. A yoga mat needs to be large enough to support a full range of yoga-based poses, so you certainly want to avoid one that is too small for full flexibility. Fortunately, the manufacturers of this yoga mat have provided more than enough room for any of the complex poses that come with this art. Its full dimensions are 71 inches long and 24 inches wide, enabling you to utilize even the widest yoga poses like Upavistha Konasana or the wide-angle seated forward bend. This mat is composed of synthetic rubber, so those with latex allergies should avoid it, but the naturally springy material is perfect for comfortably performing some of the toughest poses that yoga has to offer. The material is also naturally moisture resistant and is also slip resistant due to the material and the lining that is featured on both sides of the mat. As the strain of consistent workouts can be a bit rough on products of this type, the rubber selected for its composition is also tear resistant. 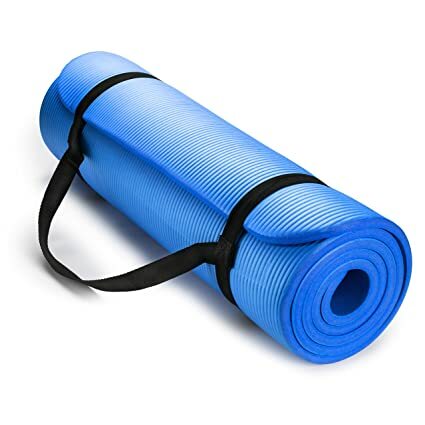 BalanceFrom also has included a free strap with the purchase of this yoga mat that will allow you to quickly roll it up and carry it with ease. 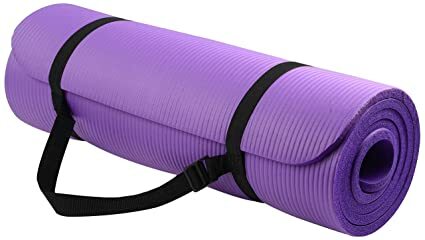 You can find this yoga mat in a plethora of colors, which include: gray, blue, purple, green, pink, red, and black. On Amazon, as of this writing, there are currently 2,989 reviews and 81 percent of them are positive, garnering this yoga mat a Amazon rating of 4.2 out of five stars. Sivan health primarily offers several products that are yoga or pilates friendly. They have a wide variety of products that include yoga and balance accessories, massage products, and devices that augment the exercise experience. Our Silver Product, their extra thick yoga mat, is the perfect mat for maintaining balance on a steady surface, as it features a dual sided construction that makes sure that you get the grip you need to perform any of the key poses that are common in yoga. Our Silver Pick mat has a similar sizing to our Gold Pick; it’s 71 inches long and 24 inches wide, so you’ll be able to perform the widest poses on this excellent yoga mat. In addition to these sizes, this mat is also a half inch thick, so that there is more than enough padding between you and the hard floor. Sivan Heatlh employed memory foam, a polyurethane material that is known for its exceptional padding, in the design of this yoga mat. This material is a great way to protect your joints from the hard surfaces, while still allowing the mat to grip the floor securely. As mentioned previously, this mat employs a dual sided construction that will enable any yogi to perform their art with comfort and security. One side is ribbed, so that as you apply your weight to the mat, the ribbed structures will grip strongly to the surface of the floor. The top side, on the other hand, is completely flat, so that when you are balancing, you won’t have to worry about any textures making your hands or feet needlessly uncomfortable. This mat also features an integrated carry strap that makes it easy to travel from place to place as well as store it neatly. Keeping these types of mats clean is imperative, as dirt reduces their ability to grip surfaces, so when you need to clean this yoga mat, simply wash it down with a cloth, soap, and water. Sivan Health has also provided a plethora of colors for its yogi customers, choices include: red, black, blue, purple, pink, green, and teal. Like our Gold Pick, this yoga mat has a sizeable amount of reviews on Amazon and similar sites. On Amazon, there are currently 1,821 reviews, and of these, 83 percent are positive. The overall rating on Amazon is 4.3 stars out of five. Hemingweigh specializes in products like acupuncture mats, Himalayan salt products, and balance disks. Our Bronze Pick, which is their memory foam yoga mat, has all of the features you’ll need to properly practice your yoga for years without worrying about the mat giving out. Like our gold and silver picks, this mat is very popular with customers as it is simple, gives any yogi great support, and is thick enough not to make poses uncomfortable. Like our previous mats, this is considered to be a larger yoga mat that has very similar dimensions (71 inches in length and 24 in width). This mat is also very thick at a half inch from top to bottom and is even comprised of the same polyurethane memory foam that our Silver Pick utilizes in its construction. This yoga mat handles standard levels of moisture with aplomb, but if you tend to sweat a lot, the mat can become somewhat oversaturated on the top layer, so a towel might be of use to reduce discomfort. Since the foam is polyurethane, the moisture will never proliferate the foam padding of this exercise product. Even when wet, this mat has exceptional gripping ability, just like our Silver Pick, it employs a ridged bottom surface that flexes securely when you stand on the its top surface. 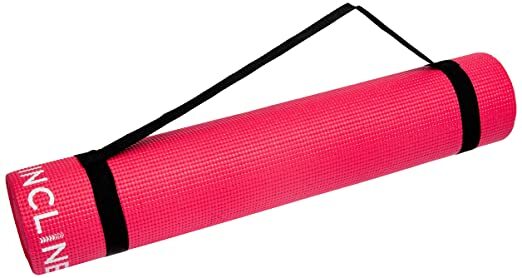 As a matter of fact, users have reported that this yoga mat blends stickiness with thickness perfectly, with many stating that the mat also has the right amount of give to make some of the harder poses like pigeon, more bearable. The available colors for this mat are blue, green, black, purple, pink, red, and teal. There is also an offer for a three pack on Amazon if you want to buy a few for yourself or plan to work out with friends. Hemingweigh also offers a two year manufacturer’s warranty on this mat, so that should it be damaged, you can get a full replacement. There are 835 reviews on Amazon, and the majority (84 percent) are positive. Like our Silver Pick, our Bronze pick has earned a 4.3 out of five star rating on the site. Typically, you can find a good yoga mat for around 20 bucks, but what if you want to establish a yoga studio and want to provide your students with quality, but don’t want to spend a lot on 30 or 40 high end mats? This is where our ballin on a budget pick comes in, it’s a quality mat that’s comprised of natural rubber and doesn’t cost an arm and a leg. Our ballin’ pick is the largest of the products that we’ve featured here by about an inch. It’s about 72 inches in length and 24 inches in width. The thickness is a little bit less than some of the other mats we’ve talked about at about ¼ of an inch thick, but it’s still plenty thick enough for your hands, feet, knees, and elbows to be more than adequately protected from hard floor surfaces. As mentioned before, this is a rubber mat, so those with latex allergies might want to avoid purchasing it. This mat also features a unique surface experience. Utilizing a waffle-weave design, the mat is very sticky on most surfaces and has a gripping ability that either matches or surpasses the majority of ribbed mats. This texturing is also not at all uncomfortable to balance on, so you won’t have to worry about the sometimes annoying texture experiences of woven mats. Like the other mats that we’ve featured here in this guide, this mat also comes complete with a carrying strap, so that transporting it will be convenient and easy. There are only five colors for this mat: dragon fruit, onyx, elephant gray, marine blue, and radiant orchard. As of this writing, this mat only has 288 reviews on Amazon and enjoys a 3.8 out of five rating. • PVC: Also known as vinyl, these yoga mats are springy and reactive. You’ll find that the majority of synthetic mats are comprised of this useful material. As a rule, these mats will maintain a firm grip on your flooring, even if you are working through a particularly shaky downward dog. As a bonus, some PVC mats are coated in polyurethane. These mats are great, even if you’re sweating, but can be found lacking if you would like to avoid chemicals or a mat with a weird chemical-like smell. Outside of these foibles, these are the easiest type of material to find in a yoga mat. • Memory Foam: This type of yoga mat is similar in feel to the PVC type; as a matter of fact, it is comprised of the same polyurethane that some PVC mats are coated in. These types can be great for maintaining a padded experience while you practice your yoga. • Natural Rubber: These are perfect if you’d like to avoid the chemicals used in a PVC mat. These are naturally sourced from rubber trees and contain no PVC, EVA, or synthetically created rubber. Since these come from a natural source, you’ll never have to worry about the manufacturing process releasing harmful chemicals into our atmosphere. There are a couple of caveats: these types don’t have as much grip as PVC mats. Also, for those who have allergies to latex, avoid natural rubber comprised mats as they will cause a reaction. • Jute: This is another eco-friendly yoga mat, this time comprised of the natural vegetable fiber, jute. Jute has been used by yogis for centuries and was once even spun into clothing in India. Jute, since it’s fibrous, tends to grip very well on most surfaces, and since it is spun into strands, also tends to do a great job at absorbing perspiration. The primarily weakness of this sustainable mat material is that over time, the threads may fray; especially if you use the mat a lot. • Organic Cotton: This is also a very classic style of yoga mat. Crafted of spun cotton, some might even mistake this mat for a rug. These are great when you are going to sweat a lot as moisture will increase the mat’s grip, so if you’re a Bikram practitioner, this might be the yoga mat for you. These aren’t as foamy and pliable as PVC, so it’s not recommended that you attempt to use these with more balance-based yoga styles like Vinyasa. As with anything, the texture of your yoga mat will vary, this is typically based on the material that it is comprised of. PVC and natural rubber tend to be relatively featureless, with the exception of lines and grooves designed to give you more tactile grip. Some yogis fault the feel of PVC and natural rubber as they like the more tactile experience of jute and cotton. Woven yoga mats like the aforementioned jute and cotton have natural textures, which will help them grip the floor more stably. As a result of this, if you’re doing a lot of balancing, you’ll find that it can get a bit uncomfortable on the surfaces of your hands and feet, and you certainly will find those textures embedded in your skin after a long day of warrior II. One note: the more textures that are inherent in your yoga mat, the harder it will be to fully clean, so take that into account. Fortunately, you can fully wash cloth and jute yoga mats, though be sure to consult the manufacturer’s instructions before subjecting your new mat to a cleaning process that may cause it damage. All yoga mats should adhere to the floor. Stickiness ensures that you’ll be able to move from pose to pose without worrying about losing your footing or having a shifting mat. Needless to say, a yoga mat that insists on sliding all over the place is not only useless for the art, but also very dangerous to you; especially if you are practicing on a harder surface. As a rule, PVC and rubber mats adhere the best; as a matter of fact, on a hardwood floor, these types can be downright annoying to actually remove after a yoga session, so you can rest assured that these types will provide a stable surface for you to downward dog upon. Remember that these types can lose their stickiness when they aren’t clean, so keep them washed frequently. On the other hand, both jute and cotton mats perform better the longer you have them, as when the fabric is exposed to your perspiration, the additional moisture loosens the strands causing them to grip better over time. This is a realm where PVC and natural rubber tend to win out over jute and cotton mats. Simply put, these types are thicker; and as a result, tend to add more bounciness to your support system, which can make your yoga easier to perform. Also, a thicker mat is more shock absorbing. Do you find yourself doing a lot of crescent lunges? On a very thin mat, such as a jute or cotton, you can actually bang your knee into the floor fairly disastrously, so you might want the extra padding that a PVC or rubber mat provides. If you find that you don’t do these types of lunges often and are more used to doing balance-heavy yoga like Bikram, then a thinner mat might be better for you, as these types tend to give you a better connection to the floor. PVC mats in this situation can actually hinder your balance somewhat, so definitely go for a thinner type if this is the case. This, of course, all comes down to aesthetics over function. With the two solid-type of mats, PVC and natural rubber, you’ll have a plethora of mostly single color options; though these mats offer cool bells and whistles like memory foam construction and built in straps. Woven mats like the jute and cotton can feature many design choices. Jute tends to have one color, but can have a plethora of patterns and designs that’ll look fantastic in your yoga room. Cotton mats can feature tassels, multicolored patterns, and even multiple layers. The design you pick will vary based on your own design preferences and the type of mat you pick, so take the time to figure out which aesthetic type works for you. Yoga is the perfect way to clear the chakras and help them attain cosmic energy at a healthier pace. Progressing in yoga isn’t easy, but you’ll find that after a while, you’ll experience less pain from arthritis, sleep much better, reduce your blood pressure, and find that you generally have much more energy. The mats that we’ve featured here today are great for those that need a little more padding during their yoga sessions, but as you’ve seen from our considerations section, there are many types to choose from if these padded products aren’t your cup of tea. The mats we’ve featured here are excellent choices for any yogi, but if you’d like to try another type, use our considerations to find a product that fits your style of yoga and your skill level. Om Namah Shivaya.